I once commented that there are only ever two real problems in bowling greenkeeping; compaction and thatch, with the rest of the myriad problems we come across being merely symptoms of these Big Two. 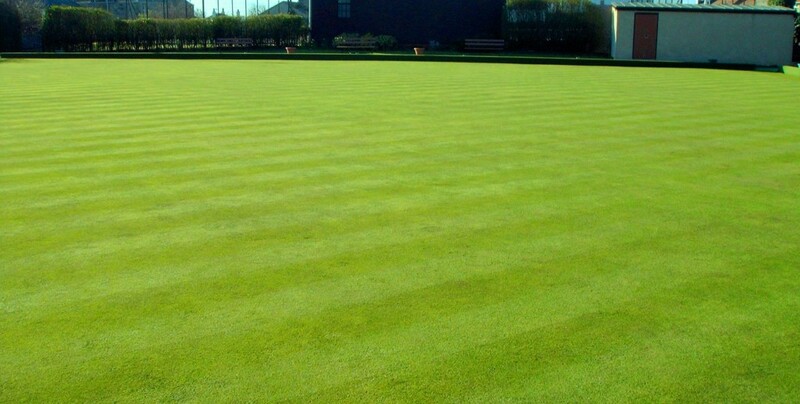 Lately, I've revised that thinking, as the more I see of ill treated bowling greens the more I realise that, although they are important, even thatch and compaction are only symptoms too. The trouble we face in greenkeeping is that the industry wants us to treat symptoms. If we treated the root cause after all, we wouldn't need to buy half as much stuff! 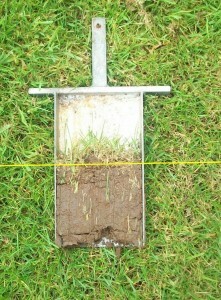 But before we get too carried away, let's have a recap on what bowls green compaction actually means. 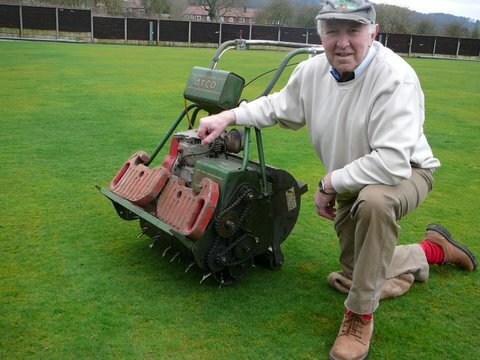 In response to my request for readers to share their ideas and experiences, Bowls-Central regular Syd Kennerley sent me a photo of his green aerator a few weeks ago. This is a machine that Syd designed and built himself and it seems to be a very effective addition to his machinery shed. 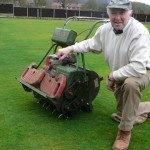 Some 15 years ago I decided to buy a spiker for our Bowling green; it was a two cylinder job, about two feet wide. When pulling it, the spikes went in to about one inch depth, but I noticed when I pushed the machine in front of me it then went in to a depth of about two inches. In those days I was a farmer and agricultural contractor, I had done Moto cross riding, Football, and also a bit of tug o war so I was reasonably fit and not frightened of hard work, but I swear to you had I continued spiking our green with that machine I would now be bowling on that superb green just beyond those Pearly Gates. I had to find a better solution to spiking the green and I had an old 24inch ride on mower which was surplus to requirements which I had already decided to sell at an implement sale at our local cattle market. I loaded the old mower and dropped it off at the sale and on the way home I stopped off to take a look at the green. I thought “this green could do with spiking” but I couldn’t face yet another trudge over the green with the old spiker. While driving from the green to home I started thinking that I could make a powered spiker by using the old mower, yes the mower that was about to be sold at the implement sale! I couldn’t get back in time to stop the mower being sold, so I rang the market and told them to put a reserve price of £500 on it and of course I got a phone call around 5pm to say the mower had not been sold due to the high reserve. With the mower back I was able to make a start on my project. I started by removing the cutting cylinder and front roller. I then removed the rear drive rollers as that was where I wanted the spike rollers to fit thus making a powered spiker. The front roller I then mounted behind the spiked cylinders; so that I could rock it back onto it for turning corners. I also used the guard of the spiker as you can see on the photo. The day of the trial run arrived on my lawn at home with just my wife to witness this grand occasion. I set the throttle just nicely ticking over and released the clutch. When she managed to finally stop laughing my wife saidif I had not held on to it so tightly it would have out raced me to the thornedge without a shadow of doubt, so back into the workshop yet again. After many visits to a lawnmower repair firm sifting through all his old sprockets, chains, and bushes I eventually got there, now ticking over it goes at a slow walking pace. lines so doing it this way I only have to make 90 degree turns rather than 180 degree, if I went back and forth as you would to cut the green. It also helps to keep compaction to a minimum and away from along the side where you might want to start your matches from. I hope I have not spoiled the picture with having yours truly on it! Thanks Syd for this fantastic story; a great example of the ingenuity and resourcefulness that goes on at clubs around the country and an example of the kind of helpful thinking we need to adopt in the future if we are going to have thriving bowling clubs. Now Syd, I need to know before Sunday: Have you ever played rugby (even once!) and do you have any distant Scottish relatives? Our eBook Bowling Club Survival and Turnaround is now available. In a revolutionary take on the Marketing of your rejuventated club we turn the commonly accepted view and perceived “wisdom about Marketing firmly on its head! In this remarkable section we demonstrate “paint by numbers instructions for achieving all of the members you want with a vastly reduced Marketing budget. In step 6 you’ll discover a remarkable system for adding 20-30% of your current income straight onto your bottom line profit!by dealing with waste in your club. A BBC2 program “Lord Sugar Tackles Football”, exposed the failures in the English Football Premiership. In a nutshell the program argued that although the creation of the super league of top clubs had resulted in the generation of vast sums of money for football, the overall result has been to create a mountain of debt and indebtedness. Lord Sugar’s conclusion was that something had to be done about player salaries to stop the rot and that the Premiership should allow one or two high profile clubs to go under to illustrate the dire nature of the situation to the Saturday afternoon faithful, who, after all, actually supply the vast sums of cash being dished out to the top talent. What on earth has this got to do with your bowling club? Well although not directly linked (unless of course a Premiership failure would free up some punters to come along to your club next Saturday!) the action required to start the turn around of the premiership’s fortunes is very much the same as that required to turnaround bowling clubs. Air is a very important component of a Performance Bowling Green. 50% of a healthy, performance green will be air; 25% Micro-pores and 25% Macro-pores. The Macro Pore or “aeration” space is where drainage happens. 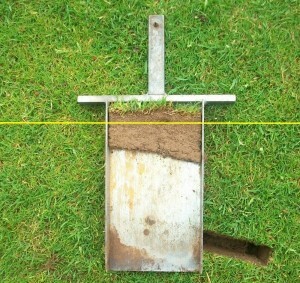 The Micro-Pore or “capillary” space is where grass plant roots get their water and nutrients. Tip the balance in favour of one or the other of these and things start to go wrong. 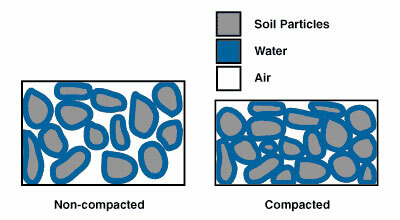 Compaction reduces the Macro air space in soil and inhibits drainage and root penetration. 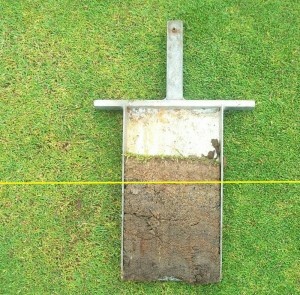 The soil now holds on to too much moisture and a whole raft of other problems ensue; particularly the build up of excessive thatch due to the anaerobic (lacking in oxygen) soil conditions brought about by the reduction in air space. Thatch becomes a breeding ground for fungal disease and a base for Localised Dry Patch to take hold. The thatch doesn’t break down naturally as it should because there is a massive reduction in the population of aerobic soil microbes and they usually do this job. Tip the balance the other way by applying excessive amounts of sand top-dressing and there is now too much air space, there is very little capillary space and the green starts to dry out too quickly. Localised Dry Patch now takes over, the surface is unpredictable and the soil can’t provide the nutrition the plants need naturally any more. Yes, for a healthy living green that performs to order you need a lot of space; 50% air space. Luckily, a healthy living soil knows how to do all of this without us. We are only needed to help rectify the damage we inflict, which is mainly compaction and nutrient depletion through the removal of grass clippings.